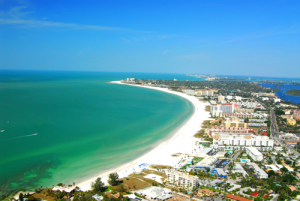 Siesta Key Has been voted the Number 1 Beach in America on several occasions, recently in 2015 Trip Advisor rated Siesta Beach Number 1, and in 2016 Dr. Beach (University Professor) rated Siesta Beach Number 1. Siesta Beach is composed on 99% quartz crystals and is unique for beaches in Sarasota County. The sand is extremely white and soft in character. In fact, during hot summers, you can walk on the sand without burning your feet! With turquoise blue waters and powdery white sand, Siesta Beach and Siesta Key is truly a one of a kind tropical paradise!